This week, as part of my Eduro Course Challenge, I observed Mrs.H introducing blogs to her grade 1 class. 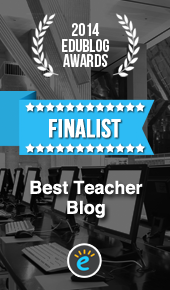 I was so pleased she chose to do this lesson, as last year it was an area of tension for her: whether blogs would enhance the community or leave students open to being compared and criticised by peers and parents. As I mentioned in my previous post, she has made tremendous progress shifting her perspective about iPads in the classroom, and has a growth mindset now on how they can benefit documentation. Her introduction included a brief discussion on what blogs were, how the app is used, followed up with an opportunity for students to make their first post in connection with their UOI (How We Organize Ourselves). Students were divided into 3 groups and in pairs, they made a post explaining how certain areas of the school were organised. It was brilliant! During the tuning-in, the Airplay shut down (when iPad fell asleep) and for some reason, the iPad projected sideways..but that didn’t dissuade Mrs.H! Like a pro, she continued on with the lesson and modified it so she could show on the iPad itself and refer to the Smartboard only when needed. We are sitting down tomorrow to discuss how it went, and I plan to use a “strengths-based” approach, as suggested in ASCD’s article (http://www.ascd.org/publications/educational-leadership/oct11/vol69/num02/The-Coach-and-the-Evaluator.aspx) since she was a bit insecure about the AirServer not cooperating and the iPad projecting sideways. I think exploring these 7 norms as an option for discussing/reflecting during collaborative meetings will also help get other team members on board with innovative ways to use tech in the classroom. Mrs. H and I have established this Google Doc to help us set goals for our meetings and be accountable for different actions. This balance of 1:1 meetings and in-class support will help foster a relationship of trust so we can both grow as teacher and coach.